Australia's Labor opposition has vowed to hold a referendum on whether the country should formally become a republic if it wins the next election. Its leader, Bill Shorten, said the move "does not change our respect to the Queen for her service, but we are not Elizabethan, we are Australians". He was referring to PM Malcolm Turnbull's description of himself as a "very strong Elizabethan", before meeting the Queen this month. The last referendum was held in 1999. 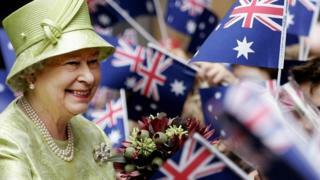 Australia is a federal parliamentary constitutional monarchy, with the Queen as head of state. Mr Shorten revealed the policy decision at the party's Queensland state conference in Townsville. The referendum would be held in the first term of a Labor government, he said. The Turnbull government returned to power in the 2016 federal election but with a razor-thin majority. Barring dissolution, the next election must be held between August 2018 and May 2019 for half of state senators and before 2 November 2019 for the House of Representatives and for Senators from territories. Mr Shorten said: "We will put a simple Yes or No question to the Australian people - do you support an Australian republic with an Australian head of state." He said the country should avoid repeating the 1999 referendum, which offered two questions and set out a model for the republic that was rejected by voters by 54.87% to 45.13%. Mr Turnbull was the leader of the republican movement at that time but since coming to power, he has said that no change should occur until the reign of Queen Elizabeth II ends. But Mr Shorten said that Australia should not wait: "The British monarchy could hardly be described as an Australian patriot, or even a loyal citizen. They will never have to sign up to our so-called values." Deputy Prime Minister Barnaby Joyce said the issue was not a priority for most Australians.